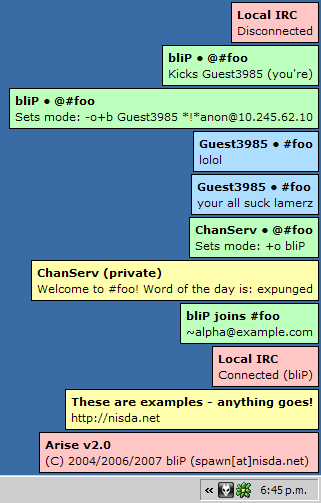 Arise (aka arise.dll) displays customizable on screen popup messages, its main purpose is to show chat or events on IRC. While it has been designed as a DLL for mIRC it includes exports to be used in other situations. v2.0 2006-04-22 Add multi-monitor support, window animations and window positions. v1.2 2005-02-08 Fixed Win9x/ME bug, thanks to meht for the report. Language: C, Windows API only. Arise was inspired by a Miranda plugin which also popped up messages. At the time I was stuck with a 17" monitor and it was tiresome to constantly switch windows to see if anything had been said, as I hadn't created a DLL yet this was good for the requirements. The small file size is achieved without any compression techniques.